It's November, and there is a lovely chill in the morning air. Baby Rora needs a new hat for our walks, one that she can't pull off! I've returned to the Purl Soho Winter Baby Bonnet. This time I'm making the free pattern in size 12-18 months. 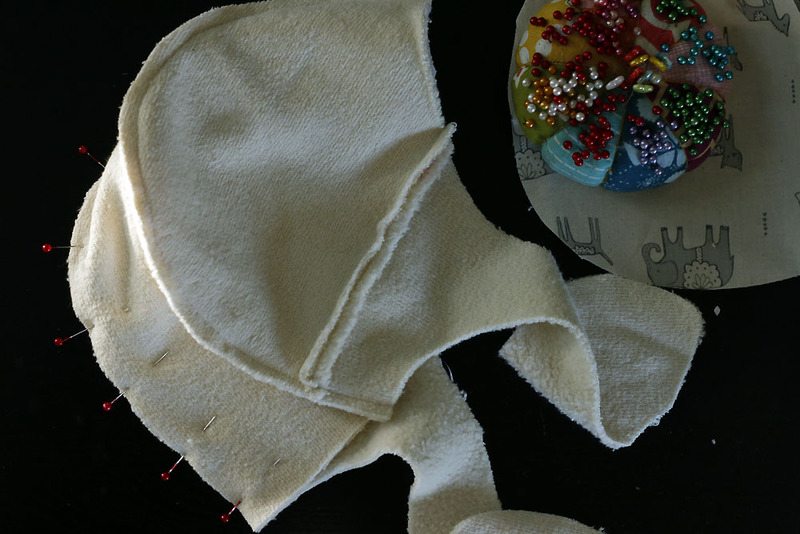 This baby hat is composed of two fabrics: the outer and a lining. I'll be lining it in cotton sherpa, which I've used lately for bib and baby blanket backings too. Another similar option is this Cloud 9 cream cotton fleece available at Crosscut Sewing Co.
For my outer fabric I had trouble choosing between Dala Friends and that lacy Deepest Purpose. I find myself wanting to use Deepest Purpose in every project. I love it so! But I chose Dala Friends because it's a baby hat. Best have fun with cute animals where you can! I ran short on sherpa, but decided to piece a bit of the lining. This seam won't be visible when it's worn. Finished in a jiffy! This is a great project for practicing your curved sewing. There are very few steps and the payoff is adorable. I got lucky when that elephant landed just so on the chin tie. It's the little things. This morning I tied it on Rora before our walk. She's not a fan of hats (and neither are her much-older siblings), but mama must insist. This one has plenty of room to last her all winter. The simple cream print will go with all the crazy outfits her mama puts her in, hehe. Hey, I actually made that dress she is wearing about 5 years ago! I am so lucky to have a baby girl to wear it today! !